And this Halloween is we can find the costumes we are all going as Star Wars people! I will be Princess Leia, Quinn is going to be Darth Vader, Brandon is going to be Chewbacca, Loki my puppy is going to be Yoda and my hubby is going to be the guy hiding behind the bushes pretending not to know us :) He isn't as open with his dorkiness as we are. It should come as no surprise my boys have Star Wars toys, posters and even a Star Wars bed frame. 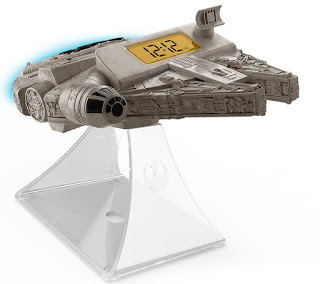 When I seen that there was a Star Wars Milennium Falcon Alarm clock I just knew we had to have it! The room would not be complete without it! This clock not only tells time, but it also makes Star Wars sound effects! You can choose to wake up to either the radio of the Millennium Falcon noise. Oh and yes you so read the word radio you can listen to the radio on this already awesome clock. There is a small night light on the back (That blue glow you see in the photo). It looks so authentic and it has had my little Star Wars fans and I smiling non stop!